RICH IN HERITAGE The Beretta Gallery in Dallas, Texas exemplifies traditional Italian quality in every detail. Located in the exclusive Highland Park area, Beretta Gallery Dallas is the perfect destination for those wishing to indulge in the rich sporting heritage of Beretta. A unique assortment of clothing and accessories for the classic outdoorsman, from leather guncases and luggage, to sports clothing for all types of hunting, shooting and country living. A distinct feature is our fascinating library of hunting books, collections of beautiful one-of-a kind gift items and hand crafted works of art. The beautiful, well-stocked gunroom in Dallas showcases Berettaâ&#x20AC;&#x2122;s full line of pistols, field and competition shotguns, as well as Sako rifles. The history of Berettaâ&#x20AC;&#x2122;s nearly 500 years of quality gun making is best exemplified by are large selection of Beretta Premium Grade shotguns and express rifles. Our professional staff is ready to answer all your requests and they look forward to welcome you to Beretta Gallery Dallas. Photo: Michel Gibert. Special thanks: Pascaline Rey. 15	THE RUNDOWN Here’s some of what we think makes this part of the world special — from Dallas Hotel Magazine. 55	SHOPPING From trendy boutiques and highend malls to hip vintage stores, DHM knows the smart spots to shop in Big D. 61	ATTRACTIONS What will make your visit memorable? Allow DHM to recommend what to do and where to go for fun and adventure in and around Dallas. 67	DINING Whether you want a quick bite or a savory sit-down meal, there’s plenty of places from which to choose in Dallas. Take a glance at our guide before heading out on your next culinary excursion. 72	OUR PARTING SHOT A joint exhibition of two of the area’s most prestigious museums features the art of native Dallasite, David Bates. 48	THE SCENE In Dallas, we’ve got events to suit everyone’s style. Check our calendar for the best of the city’s culture and entertainment during your stay. — the kidnapping of the infant son of world-famous aviator Charles Lindbergh; the child was brazenly snatched from of his second-story nursery. The manhunt that followed changed the face of America. Now Dallas author Robert Zorn’s sinister tale of Cemetery John: The Undiscovered Mastermind of the Lindbergh Kidnapping brings to the forefront compelling new evidence that may help crack this historic cold case, once and for all. What do you get when you mix Texas’ top musical talent with classic Jackson Browne songs? Looking Into You is a well-known local tycoon’s pet CD project that inventively pairs some of the songwriter’s best works with the likes of Don Henley (“These Days”), Lyle Lovett (“Our Lady of the Well” and “Rosie”), Shawn Colvin (“Call It a Loan”) and other top musical artists. Then, join us behind Tom Spicer’s Dallas shop for a tour of his incredible organic garden of greens. His specialty is spice — the freshest varieties — and his best customers are many of the area’s top restaurants. We’ll explain. Finally, our Parting Shot is a special tribute to native Texan David Bates and his amazing exhibition of art that’s happening simultaneously in Dallas and in Fort Worth. Looking for shopping, destination dining or an evening on the town? The Scene contains up-to-date listings on everything from concerts and sports to seasonal happenings and community activities, all designed to help plan your time in Dallas. Now matter what the season, welcome to North Central Texas’ home of fun. 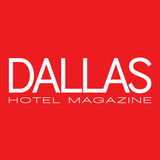 Please enjoy this edition of Dallas Hotel Magazine with our compliments. It’s the definitive guide for discerning visitors to Big D.
S H O P. D R I N K . D I N E . D A N C E . D E L I G H T.
Reproduction without permission from publisher is prohibited. Although every effort has been made to ensure the accuracy of the information contained in the publication, the publisher cannot accept liability for errors and omissions. laid-back luxury and relaxed contentment Nestled on one of the country’s most beautiful The resort’s famous white-sand beach stretches 600 beaches, Viceroy Zihuatanejo is a paradise for couples feet along a gorgeous sweep of coastline. Spend the and families alike on Mexico’s Pacific coast. day relaxing on a lounger, shaded by palms and a thatched palapa, being pampered by a Beach Butler The 46 luxurious guestrooms and suites are tastefully and enjoying a massage in the Spa Palapa. appointed with artisanal Mexican design elements in earthy color palettes. All are just steps from the Guests indulge in massages and one-of-a-kind beach, have a unique design and a private terrace indigenous treatments performed by highly skilled or balcony overlooking lush gardens or tranquil therapists at the intimate spa. Zihuatanejo Bay. All suites have a private plunge pool. The fun and activities are nonstop with three Viceroy Zihuatanejo stands out for its gourmet dining, swimming pools, two lighted tennis courts, airfrom mouth-watering Mediterranean and Mexican conditioned fitness center and everything from seafood in La Marea and modern interpretations of windsurfing, snorkeling and deep sea fishing to fly Pacific-Mexican cuisine served al fresco in La Villa to boarding and nearby golf. Zihuatanejo Bay’s warm, fresh ceviches and 110 specialty tequilas in the Coral naturally sheltered waters are ideal for swimming Bar. Private dinners in La Cava wine cellar feature and water sports year-round. wine pairings drawn from a collection of more than 1,250 labels. Here’s some of what we think makes this part of the world special — from Dallas Hotel Magazine. General manager Tonya Wilbanks and executive chef Andreas Kotsifos toast the The Palm in Dallas for providing three decades of excellent food and quality service to its customers. Happy 30th Birthday to The Palm in Dallas! The original Palm Restaurant has always been one of New York City’s hot spots. Visitors can still see the early hand-drawn sketches on the walls that were restored in 1995. The Caricature Tradition When The Palm first opened in New York, no funds were available with which to decorate. Luckily, its location on Manhattan’s Second Avenue was in close proximity to King Features Syndicate headquarters and attracted a large clientele of cartoonists. In exchange for their meals, artists would often draw creations on The Palm’s walls. Since then, the flagship Palm has become a living museum of cartoons and caricatures featuring such famous faces as Popeye, Batman, Beetle Bailey, Hagar the Horrible and characters from “The Family Circus.” The Palm’s walls were professionally restored in 1995 to preserve these legendary sketches, many of which were drawn in charcoal and pastels. The tradition of decorating with caricatures has continued as The Palm has expanded across the U.S. and internationally. New caricatures of regulars and celebrities are added frequently to each restaurant’s walls. In Dallas, patrons can see renderings of Emmitt Smith, Troy Aikman, the Fox Sports Team, the late Kidd Kraddick and many other celebrities while dining. The Scarborough Renaissance Festival offers a springtime escape to the 16th century Once upon a time, in a land not so very far away — only 30 minutes from Dallas, in fact — is a place reminiscent of days of yore, where women are addressed as “Milady” and men, as “Milord.” In the village of Scarborough, King Henry VIII and his royal court rule over the minions, and knights in shining armor prove that chivalry is far from dead. This fanciful 16th century English village magically appears each year during North Central Texas’ spectacular spring. All ages, some decked out in period costumes, come to join in the revelry that takes place every weekend through April and May and on Memorial Day. No worries if you’ve left your Renaissance regalia at home or just want to get in on the fun: Costumes, welcome but not required, are available for rent just inside the entrance or may be purchased at one of the many shops on the grounds. April 5 and 6 OPENING WEEKEND Children ages 5 through 12 are admitted free all weekend (up to three children with each paid adult admission). Seniors (ages 65 and older) are admitted for $12. Discount is available only at the Ticket Office. horseback, impressive birds-ofprey demonstrations, Cirque du Sewer (rat circus) and the hilarious Human Chess Match. And plan to stake out the best possible spot for the Grand Parade, a daily procession of the village’s cast of colorful characters who bring this fantastical place to life. For an escape from the hustle and bustle of city life, leave those Dallas skyscrapers in your rearview mirror and head south to Waxahachie. The Scarborough Renaissance Festival awaits. — ERS Tickets are $24 for adults, $10 for children ages 5 through 10, and free for children ages 4 and under. Parking is free, compliments of Waxahachie Autoplex. Individual and group discount tickets are available. For more information, visit SRFestival.com. April 26 and 27 ROYAL ALE FESTIVAL Tastings of assorted beer and a variety of entertainment each day from 1 to 3 p.m. Tickets may be purchased online before the tasting. May 3 and 4 LEGENDS OF THE SEA WEEKEND May 10 and 11 MOTHER’S DAY WEEKEND “Royal Tea” with the Queen at 3 p.m. each day. Tickets may be purchased online. Seating is limited. May 17 and 18 RENAISSANCE ROMANCE AND CHIVALRY WEEKEND Wedding-vow renewal ceremonies; special enhanced wine tasting. May 24, 25 and 26 FINAL KNIGHTS WEEKEND Special Veterans’ Parade on Memorial Day, May 26. All veterans are invited to don the yellow sash and march in the parade. Ask for directions at the entrance. Catch Texas basketball bedlam when a pair of former NBA world champs battle it out on the hardwoods. She rocketed to success with “You Light Up My Life” and is now on tour reviving the lush big-band arrangements of the ‘40s. The counter-culture artist, writer, actor and filmmaker (Hairspray, Pink Flamingos, Cry-Baby, Pecker) packs a potent punch with his latest one-man show. Salute and support Texas’ first responders and their families at this Memorial Day celebration along Dallas’ Katy Trail. Time says, “This high-energy musical brings happiness wherever it goes!” Hit songs by the Swedish pop band ABBA fuels the Dallas Summer Musicals favorite. First stop: Mockingbird Station. Go where shopping, dining and entertainment are only the beginning. Take the DART Rail past the expected — and take your free time even further. Forget Chinese, French or Italian. You’ve come all the way to Texas — home of the steer — and you want some meat. From mouthwatering ribeyes to succulent strips, the best steaks in the country can be found right here. Because there’s nothing better than that first bite of premium beef grilled to perfection, we’ve rounded up a list of some of the best steakhouses in Dallas. At each one you’ll find fine dining, excellent service, extensive wine lists and prime cuts of beef you will be raving about for days. drinks are stiff. If you’re not a regular already, come by and let us show why we’re so proud of what we do and why you should be. At our original Dallas location, Co-Owner & General Manager, Jessica Smith will help ensure that you have a perfect dining experience. Offering upscale American cuisine, Al Biernat’s specializes in prime steaks and seafood. Enjoy a semi-casual atmosphere and an award-winning wine list featuring more than 650 selections from around the world. Dallas photographer Pete Lacker took this image (see album cover above) of Jackson Browne’s piano at his childhood home in Los Angeles, where he learned to play. Looking Into You is a tribute to singer and songwriter Jackson Browne that brings some of the world’s biggest names in music together on two CDs. DHM talks with Kelcy Warren, the Texan who made it happen. King of Greens Next time you’re fine dining in Dallas, take a look at your salad. Chances are good those greens came from Tom Spicer’s garden. rainbow and a handful of other edibles. His shop caters not just to chefs but also to home cooks and civilian food enthusiasts. Inside, the hubub provides a glimpse into Spicer’s passion for plants. Spicer’s sun-worn exterior initially projects an air of crustiness, but that melts immediately like a chocolate shell, and visitors find him warm, inquisitive and full of wonderful, colorful yarns about his life. Lucky visitors may be treated to a mini-tour, if he’s feeling especially chummy that day. “We allow people to come in … if they’re brave enough to venture in,” he notes. LEFT: Tom Spicer holds a cucumber-flavored herb called borage in his mouth before eating it. Lemon thyme (above) and lemon verbena (right) are two of the herbs Tom Spicer planted on the grounds of Rosewood Mansion on Turtle Creek for the hotel’s restaurant that serves haute cuisine — Texas style. boom! Right then and there, I was shot out of a cannon.” A produce company saw his potential and joined his heirloom bandwagon. However, when another firm bought it out, moved away from specialty produce and focused on snagging large corporate accounts, such as the New Orleans school system and cruise ships, the resulting disconnect inspired Spicer to leave for Dallas. Once here, he fell right back into the produce-centric employment he loved and moved himself and the industry in a new direction. “When I was stacking apples [at the former Bluebonnet Natural Foods], I was not only finding out who the produce distributors were that we would buy from, but who the farmers were as well,” Spicer says. “Seeing the market change, I brought specialty produce to Dallas; it wasn’t here.” Spicer characterizes his career in 7-year cycles. The first kicked off after his time at Bluebonnet, when he became the aforementioned farm whisperer, bringing small operations to greater profitability. The second cycle was spent as a farm produce broker, which allowed him to work out of his home and rear his two sons. Tom Spicer in his urban garden behind his store, FM 1410. Dallas author Robert Zorn’s sinister tale, Cemetery John: The Undiscovered Mastermind of the Lindbergh Kidnapping, may help solve what was known as the ‘crime of the century’ once and for all. The culmination of research by author Robert Zorn and his father, Eugene, led to the publication of Cemetery John: The Undiscovered Mastermind of the Lindbergh Kidnapping. delivered a ransom for the return have occurred sometime between of his son, all to no avail. Seventy- 9 p.m. and 10 p.m. two days after the ordeal began, On a stormy, moonless night, Charlie’s scavenged remains were the only child of America’s most discovered deep in a roadside celebrated couple had been thicket on a hill a few miles taken brazenly, as five adults south of the family estate. In all elsewhere in the house were likelihood, the child had died on winding down their evening. the night of his abduction. Was this feat the result of careful Charlie’s nursery occupied the planning and execution or just southeast hazard and corner of luck? Did the n, ga “I had no idea, as I be the second kidnapping uld involve more floor of the how long the work wo e Lindbergh than one take, where the chas home. In the person? Was en ev or , would lead me aftermath it, in part, of the an inside how to pursue it” kidnapping, job? Was the three sections of a custom-made death of the child accidental or wood ladder were found 25 yards intentional, and, if the latter, why from that corner, near a cluster and how was he killed? of trees. An envelope containing Despite the eventual arrest, a ransom note was found on conviction and execution of the sill of a window through Bruno Richard Hauptmann for which the kidnapper apparently the crime, a great number of had entered. On that evening unsettling questions persist, and of March 1, Charlie had been they have haunted investigators put to bed at 8 p.m. It was later and students of the case for more determined that the breach must than 80 years. As a 15-year-old boy growing up in the South Bronx, Gene Zorn (1916-2006) unwittingly witnessed his German immigrant neighbors John and Walter Knoll conspiring with Bruno Hauptmann to kidnap the Lindbergh baby. Not until decades later, after he had become the chief economist at the Republic National Bank of Dallas, did Zorn come to understand the significance of what he had seen and heard on a summer day in 1931.
the end, he managed to make his way home to the Bronx by himself. Baffled and a bit shaken, he simply suppressed what he’d heard and seen that day, but he would not forget it. Gene attended City College of New York and Columbia University and went on to become a renowned economist. He was cultured and methodical. The author of hundreds of articles and professional papers, his analytical approach was cautious, his conclusions insightful. Advancement in his profession led Gene ultimately to Texas. In 1963, one month after the assassination of President John F. Kennedy, Gene walked into a North Dallas barbershop, picked up a magazine and happened upon an article about the Lindbergh kidnapping. In the story, he found detailed discussions of the physical evidence in the case and surmises about the likelihood that Hauptmann, who lived in the Bronx, had not acted alone. Seen here is the 1932 police sketch of the kidnapper, known as “Cemetery John,” (left) and a photo of young Gene Zorn’s Bronx neighbor, John Knoll (right). The identity of Cemetery John was a mystery for 80 years, until the publication of Zorn’s book. The kidnappers’ signature symbol appears in the lower right-hand corner of the ransom notes. The signature symbol looks very much like a cachet: artwork on envelopes that commemorates a historical event or feat. Three weeks after the Lindbergh ransom was paid, John Knoll became extremely generous to Gene Zorn by making contributions to the boy’s stamp collection. Gene, a future economist with a keen intuition into money matters, found it odd that the deli clerk, who lived in a rented room, could afford to buy entire collections of stamps from other collectors. This is one of three collectibles pertaining to Lindbergh that Knoll gave young Zorn (see Lindbergh Airmail postage stamp). Many others pertained to aviation. John Knoll’s in-laws, Ida and Robert Karg, are seen here at their home in Germany. The Kargs told their daughter, Lilli, to “get rid of that bum [John Knoll],” and helped her plan an escape. In 1936, Lilli left Knoll, took the couple’s infant son and fled to Nazi Germany, where she and the boy lived until after WWII. This photo was taken Dec. 8, 1934, aboard the luxury liner SS Manhattan on a trip from New York, N.Y., to Hamburg, Germany. The date was three-and-one-half weeks before Bruno Hauptmann, alleged accomplice of John Knoll, went on trial in a Flemington, N.J., court for murdering the Lindbergh baby. John Knoll (left), whose hair was dyed black, looks straight into the camera lens, while his bride, Lilli, gazes at her husband. caper. “Viewed in that light,” the presence of a pronounced Zorn said, “it may well be that my deformity in the thumb of John’s father’s accidental witnessing of left hand—a deformity that had the meeting with a man called been noted in a key eyewitness Bruno was, in fact, no accident.” description of Cemetery John. Zorn has made every effort Photographs of John closely to contact surviving relatives of resemble law enforcement John and Walter in the U.S. and sketches of Cemetery John, Europe and has and physical come to know descriptions of y ar “An extraordin and admire many the two match number of written members of the uncannily. In Knoll family Zorn’s view, these communications through dozens of were conveyed from physical markers communications, constituted a the kidnappers to visits and breakthrough in the Lindberghs, interviews. “I’m the case. h ic grateful to these The true wh of most folks and have identity of r lia cu carried a pe tried my best to Cemetery John as signature symbol be sympathetic, had eluded while still painting investigators, but authentication” as accurate a Zorn became picture as possible,” he said. “The convinced that John was, in fact, fact that so much critical evidence the man who had taken the and information has come from ransom money that night in 1932. Knoll’s family is part of the About one-third of the $50,000 miracle of this story.” ransom was later traced to Bruno Family photographs and Richard Hauptmann; the rest was testimony have documented never recovered. The Delft tiles in the fireplace surround would have made it easy for anyone entering the Lindbergh home during construction to determine this room was a nursery. In November 2012, Robert Zorn was one of five authors invited to speak at the Morton H. Meyerson Symphony Center in Dallas in support of the Barbara Bush Foundation for Family Literacy. Walter Knoll, one of the alleged kidnappers and younger brother of alleged Lindbergh kidnapping mastermind, John Knoll, chose Woodlawn Cemetery in the Bronx, N.Y., for his final resting place. This cemetery is where Walter’s brother John first met the intermediary in the Lindbergh kidnapping case, “Jafsie” Condon. Robert Zorn meets relatives of John and Walter Knoll in Herxheimweyher, the western German village in which the Knoll brothers were reared. adamant that, if it becomes clear that Knoll had no involvement in the kidnapping, he will let it be known. The twinned tales of Lindbergh’s unprecedented fame and the terrible crime visited upon his family have made this story endlessly compelling. The shock effect of the crime on American culture may have diminished over the decades, but it has never gone away. The kidnapping and murder of Charlie Lindbergh established a benchmark of combined brutality, mystery, private dread, and public impact by which the most notorious crimes have come to be gauged. The case so outraged the nation that, in 1932, Congress adopted a sweeping Federal kidnapping statute still known today as the Lindbergh Law. For now, Zorn has more investigating to do. He is convinced he will uncover more evidence in what remains one of the most compelling true crime stories in American history. A TALE OF TWO ROBERTS In the last issue of Dallas Hotel Magazine, another local author, Robert Edsel, was profiled. His bestselling book, The Monuments Men: Allied Heroes, Nazi Thieves and the Greatest Treasure Hunt in History, inspired a recent film that was directed by George Clooney and featured an all-star cast. Robert Edsel and Robert Zorn go back a long way. They were classmates at St. Mark’s School of Texas and have remained mutually supportive friends. In an interview apropos of The Monuments Men, Clooney said, “It’s so rare to do any story that people don’t know.” It seems a bit surreal that two long-parted friends and classmates would come to write about two of the most notorious crimes of the 20th century and that each, in the end, would find within his respective story an “unknown” story and illuminate it in a most improbable way. 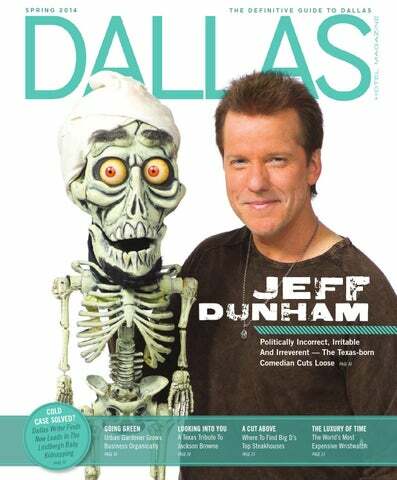 Ventriloquist Jeff Dunham explains how he made it from Dallas to stardom â&#x20AC;&#x201D; albeit with a little help from his friends. Characters such as Peanut (left) and José Jalapeño on a Stick (right) are two of Dunham’s popular sidekicks. Dunham has said that legendary actress Bette Davis, with whom he appeared once on The Tonight Show, was the original inspiration for Walter. can be heard in the animated comedy, The Nut Job, starring alongside actors Will Arnett, Liam Neeson, Katherine Heigl and Brendan Fraser. For the past several years, Forbes has included Dunham in the magazine’s Celebrity 100 list of most powerful entertainers. In terms of earning power, he can go toe-to-toe with any of the top stand-up comics. Industry trade magazine Pollstar listed Dunham as the world’s top-grossing live comedy act two years running. The New York Times Magazine once declared Dunham “the most successful comedian working in America,” echoed by Time, which named him “the most popular comedian in the U.S.” However, unlike his comic colleagues, Dunham’s brand of stand-up is no solo affair; it involves an entire entourage made up of his outrageously colorful characters. His “dummies” are far from stupid; they can be alternatively sweet, sour, irritable, insulting, endearing and uproariously politically incorrect. “If I come up with a new character that doesn’t entertain me after a few shows, he’s gone…” he explains. “There is no formula for creating them. The only thread I can see is that they all make me laugh, and I enjoy performing with them.” The humor can be a tad puerile and not necessarily for everyone in the audience. But for those fans that do connect — bull’s-eye! There’s his go-to guy, cantankerous Walter, the prototypical grumpy old man with an attitude to match. PEANUT Fast and furious, the lovable purple sidekick with a quick wit and unendingly energy is anything but a dummy. SWEET DADDY Word! Old school, hip and totally street savvy, he’s a little playa’ who brings some soul to the stage. WALTER Unapologetically opinionated, this ol’ grandpa puts a whole new spin on “in your face” with a never-ending stream of guff. “I become a chameleon in front of any given audience: whatever their favorite for the night is mine,” says Dunham. “One night Peanut will be the hands-down favorite, and then another night it will be Walter or Achmed.” Dunham has flirted with controversy over the years. Some groups have leveled charges of racism at him, particularly regarding Achmed the Dead Terrorist, whom he introduced in the wake of the 9-11 attacks. Dunham calmed the waters, pointing out that comedy is the last form of free speech, as well as the fact that, in his act, absolutely no one is spared from the skewer. autobiography, All By My Selves: Walter, Peanut, Achmed and Me. It became a New York Times bestseller. A year later, Jeff Dunham: Birth of a Dummy, aired on The Biography Channel; it has been listed as the cable channel’s highest-rated broadcast of all time. “There is no formula for creating [each character]. The only thread I can see with them is that they all make me laugh.” has his own ventriloquist dummy named, naturally, Little Jeff; and Achmed, a would-be jihadist — if only he hadn’t blown himself up. BUBBA J There’s redneck, and then there’s this goofy guy who takes trailer-park trash to a whole new level. JOSÉ JALAPEÑO This spicy South-of-the-border con artist delivers his hilarious lines with a straight face…on a steek! MELVIN THE SUPER HERO GUY This lovable nerd’s distinctive features are his phallic-shaped nose and the snazzy crime-fighting costume he bought on eBay. ACHMED This would-be terrorist inadvertently made himself the victim of an accidental bomb blast. Now that’s funny! for years. They shared a love had missed an assignment. So he He graduated from Baylor of television and, of all things, got this remote-controlled robot University with a degree in radio-controlled helicopters. to deliver his homework, right in communications, then moved “Jeff did mornings on the FM the middle of class.” to Los Angeles in 1988 and station, which was contemporary “Here comes this little robot, immediately hit the circuit – the hit music,” says Harper. “And he rolling across the floor right up Improv, Comedy & Magic Club in was also our in-house funnyman. to the professor holding Jeff’s Hermosa Beach, and others. I remember a couple of company assignment. He was always doing Five years later, after a rash of Christmas parties where Jeff was funny, off-the-wall stuff. We knew cancellations by NBC bookers, the entertainment.” Dunham also appeared in the local “I was one of those lucky people who found a segments within the Jerry Lewis Labor Day passion at a very early age for what I could Telethon, which KWTX carried. “One time, he and would do for the rest of my life.” went from running a studio camera on the telethon, to changing into a suit, he’d be huge someday.” he finally made his debut on getting Peanut and being on the By the mid-’80s Dunham The Tonight Show. It had been a telethon as talent, then going landed feature spots opening 10-year goal for the Texas comic, back and running camera again,” for name entertainers, including and, at last, he had arrived. laughs Harper, now a successful Bob Hope and George Burns. corporate vice president and In 1985, he went to Broadway as “HEEERE’S JOHNNY!” chief technology officer. part of the Ann Miller-Mickey Throughout Johnny Carson’s His college pal Archie Rooney burlesque romp, Sugar three decades on the show, Woodard, now a Dallas television Babies. Dunham appeared for Dunham had the distinction, engineer, also has fond memories 12 minutes onstage, which during a maiden Tonight Show of Dunham. “He was constantly allowed the show’s star to change appearance, of being one of only doing stuff outside the box,” says costumes. But it was just the a handful of comics invited to Woodard. “I remember once Jeff career jumpstart he needed. join the host on his fabled couch. Well, I’ll Be a Howdy Doody! Born and reared in Dallas, the 48-year old comic and singer can do more than 100 impersonations as a ventriloquist. He uses almost 20 different puppets in his act. Fator won season two of America’s Got Talent on NBC. The following year, he signed as the headliner at The Mirage in Las Vegas. He’s probably best known for his role on ABC’s idiosyncratic comedy Soap as Chuck, a ventriloquist convinced his dummy was real. Active in television and onstage, the Lubbock native’s Tony-Award winning Jay Johnson: The Two And Only opened on Broadway in 2006. “Bob,” his TV dummy, now makes his home in the Smithsonian. The El Paso native has headlined in Las Vegas for years. He was a semi-regular on a revival of The Match Game and a version of The Smothers Brothers Comedy Hour. Some of his favorite puppets include Buffalo Billy, a lovable West Texas cowboy, and Scorch, a green dragon who starred in his own short-lived sitcom on CBS in 1992. Did you know Texas is a breeding ground for some of the top ventriloquists in show business? Jeff Dunham may be the best known these days, but the state also can claim a number of others with similar skill sets. Depending on the audience, one night Peanut will be the hands-down favorite, and then another night the favorite will be Achmed or Walter, Dunham says. Dunham flirted with controversy regarding Achmed, a would-be jihadist, whom he introduced in the wake of the 9-11 attacks. This free, three-day music festival brings some of music’s biggest superstars to the stage in celebration of college basketball’s biggest event, the NCAA Men’s Final Four. The non-ticketed event is open to the public on a firstcome, first-serve basis. In Dallas, we’ve got events to suit everyone’s style. Check our calendar for the best of the city’s culture and entertainment during your stay. Ross has helped shape the sound of popular music, from her years with The Supremes through today, paving the way for influential singers of successive generations with hits such as “Stop! In the Name of Love” and “Ain’t No Mountain High Enough.” The concert benefits Vogel Alcove, a Dallas-based nonprofit that provides services to young children. Spring is popping out all over! — especially at Dallas’ awardwinning, 66-acre botanical garden. Stroll around the grounds filled with spectacular floral displays and landscaping that feature hundreds of tulips, azaleas, daffodils, pansies, poppies and more than 100 blossoming cherry blossom trees. Hear live music during the Cool Thursdays series. Esquire editor at large and author of the memoir The Know-It-All: One Man’s Humble Quest to Become the Smartest Person in the World offers his insights during this event. Sample small bites from some of the area’s top chefs who will share their talents to help the fight against neurofibromatosis. Rossini’s romp centers on “Figaro, Figaro, Figaro,” the scheming barber. See it in person or catch the free, April 11 simulcast at AT&T Stadium. Experience the rush of a lifetime sprinting on a quarter-mile track with up to 24 different 1,200-pound bulls on your heels. Dallas International Film Festival Cast, crew and fans are all regulars at this annual festival, discussing their work, previewing films, animated shorts and more. Experience the ornate ecstasy of the Baroque. Conducting from the harpsichord, Ottavio Dantone leads works of Vivaldi, Corelli and Handel. Vows of eternal friendship are put to the ultimate test in this story of desire and sacrifice set in ancient Ceylon. This third-annual festival focuses on Texas craft beers and the emerging North Texas craft-beer scene. Sample from exclusive kegs, rare brews, one-offs and special firkins from nearly 100 breweries, and grab good eats from food trucks. Motionhouse Performers have inventively created passionate theater fusing eye-popping images, action and dynamism to delight audiences worldwide. Breathtaking and hopelessly romantic is the tragic story of the popular Angentine First Lady Eva Peron in this unforgettable, Tony Award winning rags-to-riches saga for the ages, with music by Andrew Lloyd Webber and lyrics by Tim Rice. Caroline Bowman plays Evita and getting rave reviews. Two evening performances celebrate the legacy of Ann Williams, DBDT’s founder and artistic director, with new company ballets choreographed by Lily Weiss and Christopher Vo as well as spectacular performances by the Texas Ballet Theater, Bruce Wood Project and Troy Powell of the Alvin Ailey American Dance Theater. Undeniably the reigning virtuoso of the violin, this magnificent performer enjoys superstar status rarely afforded a classical musician. Beloved for his charm and humanity as well as his talent, Perlman is treasured by international audiences who respond to his remarkable artistry and irrepressible joy for making music. Music director Jaap van Zweden leads a three-week series of Beethoven symphonies, concertos and chamber masterpieces. Programs include Beethoven’s Fifth and Ninth (“Ode to Joy”) symphonies and the “Emperor” Concerto featuring pianist Yefim Bronfman. From classic pas de deux to awe-inspiring contemporary works, it’s an evening of artistry featuring some of the world’s most loved stars. Sample food from top area restaurants, enjoy celebrity chef demos, wine tasting seminars, and the music of Texas musician Pat Green. Wildflower! Arts and Music Festival Get in on this springtime North Texas arts and eclectic music festival that boasts six performance stages loaded with big-name entertainment, an open-air marketplace, a tasty food garden, a family-friendly zone and more. This trio of bands has deep connections back to the golden era of 1970s classic rock in San Francisco. Dallas native Steve Miller is joined by one of music’s greatest horn sections along with superstar guitarist Neal Schon, Jonathan Cain and his Journey bandmates. From Toy Story to The Incredibles and more, enjoy the music from these modern-day animated classics played with clips from the movies. Headliners include DJ David Guetta, Alabama Shakes, hip-hop artist J. Cole, Tegan and Sara, Violent Femmes and Third Eye Blind. Czech heritage in Texas is on parade with polka bands, a variety of authentic foods, costumes, culture and more. Lee’s hit, “Lookin’ for Love,” spent months on the country and pop charts in 1980 was a driving force behind America’s urban-cowboy craze. Enjoy demos, samplings, wine pairings, craft beer, liquor and wine tastings plus evolving cocktails, Scotch flight tastings and more. Hits like “I Don’t Want To Be” made him a star. His “Best I Ever Had” sold over a million records. The summer concert series features Will Johnson, Cas Haley, Tim DeLaughter, Gary Clark, Jr. and more playing to intimate crowds on a green lawn. His “Across 110th Street” and “Woman’s Gotta to Have It” are classics, but only scratch the surface of an historic catalog. From quick sketches to watercolors, works by Degas, Cézanne, van Gogh and others, offer new insights into the working methods. Rescheduled from earlier this year, the renowned classical pianist performs as part of an exciting new recital series. Catch pop-music royalty backed by a 24-person choir and an eight-piece band with eye-popping sets, spectacular light shows and top-notch audio. The audience becomes part of the show, singing and dancing in their seats. This highly anticipated production features one of Broadway’s biggest shows with incredible staging and songs to match. Few artists can lay claim to the extraordinarily broad influence Sweet Baby James has had on American music over the years. Quintessential hits such as “Fire and Rain,” “You’ve Got a Friend,” “Carolina in My Mind,” “How Sweet It Is (To Be Loved By You) and “Shower the People” span generations and are among pop music’s crown jewels. Develop a discerning eye for what’s real and what’s not by studying pieces from the museum’s collection and from generous loans of natural-worked stones. Primarily nephrite and jadeite, two distinct materials prized by collectors of Chinese jade, are on view. The native Texan’s accomplishments as a professional golfer were as impressive as his swing. He called the tournament named in his honor, “the best thing to every happen to me in golf.” Lord Byron’s legacy lives on at the annual PGA event that includes many of the game’s biggest names. Eleven stakes races, including the Grade 3 $200,000 Texas Mile and the Grade 3 $200,000 Lone Star Park Handicap, highlight the season as DFW’s largest such horseracing track opens with 50 events. Live racing is held four days a week at the facility just a short drive from Dallas. SHOPPING CENTERS ALLEN PREMIUM OUTLETS Home to 100 designer namebrand outlets such as BCBG Max Azria, Coach, Cole Haan, J.Crew, Juicy Couture, Lacoste and Last Call by Neiman Marcus, it also offers savings up to 65 percent! HIGHLAND PARK VILLAGE This shopping village is as close as you’ll get to Rodeo Drive. Built in the 1930s, this ultrachic corner of high-end shopping in Dallas’ most exclusive neighborhood sports boutiques such as Hermès, Jimmy Choo, Escada, Cole Haan, Chanel, Ralph Lauren, St. John and more. creative staff makes all the difference in this one-of-a-kind store with great prices. Designer Paulette Martsolf dreamed of coming to Texas to design women’s clothing and jewelry, opening this store in 1989. It has since become a women’s paradise, and her designs have become world-known. Legendary Dallas Fashion at Astonishing Resale Prices. Enjoy a selection of premier mens and ladies apparel, hats, belts, buckles and jewelry as well as the largest collection of handmade cowboy boots in the United States. just western wear, you’ll find a lifestyle. Offering a wide range of exclusive collections, Pinto Ranch embodies the romanticism and traditions of the old West combined with contemporary style and handcrafted quality. mills such as Loro Piana, Holland & Sherry and Dormeuil. your clients in one of the spacious, open-air suites or try your luck at a foul ball where the proximity of the fans to the action is among the closest in the major leagues. AMERICAN AIRLINES CENTER The American Airlines Center has set a new standard for sports and entertainment. Home to the Dallas Mavericks and the Stars, it features 142 luxury suites and room for 20,000 fans. The AAC brings the hottest sports, concerts and family entertainment to town. Showcasing hundreds of performances every year, with four spectacular venues and a 10acre urban park, the center plays host to some of the most virtuosic artists and performers as well as premier touring productions. AT&T STADIUM Take a tour of the eighth wonder of the world, the $1.15 billion AT&T Stadium in Arlington, featuring the largest LED screen in existence. Located in the heart of Richardson’s business and technology area, the Charles W. Eisemann Center has been recognized as one of the leading performing arts facilities serving the Dallas-Fort Worth area. plays host to various music legends throughout the year. This rare gem encompassing 68 acres and 19 blocks is the centerpiece of Dallas’ cultural life. With arts venues such as the Dallas Museum of Art, the Nasher Sculpture Center and the Morton H. Meyerson Symphony Center, this area is home for art lovers. of modern and contemporary Quality is of the highest importance international art housed in in the compilation of masterpieces 53,000 square feet of gallery that call the Kimbell home. Come space at The Modern. visit the new $137 million Piano 3200 Darnell St. Pavillion opposite the museum’s Fort Worth, Texas original building designed by the 817.738.9215 themodern.org great Louis I. Kahn. ATTRACTIONS CROW COLLECTION OF ASIAN ART This 12,000-square-foot museum includes four light-filled galleries that house selections from the permanent collection including a widely acclaimed array of Chinese jade. The Crow also features touring exhibitions from Japan, India, China and Southeast Asia. The culmination of decades’ worth of work, this 180,000-squarefoot facility extends beyond the typical museum experience, offering the young and the old the opportunity to explore new ideas through tangible, galvanic exhibits. Experience the serene atmosphere of the Omni Dallas Hotel’s signature Mokara Spa, a calming oasis in the heart of downtown. Begin your retreat in the relaxation room, and then make your way to a true spa escape as you enjoy your choice of body treatments. Complete your total departure by indulging in our delectable dining options, from farm-to-market creations at Texas Spice to savory fare at Bob’s Steak & Chop House. living. Please look for our grand opening in late spring. This eclectic Dallas restaurant pushes the envelope with its fusion cuisine. Legendary chef and owner Kent Rathbun offers world cuisine ranging from Thai, Spanish and Japanese to “homeboy” dishes like bacon and eggs. A block from the Arts District, this restaurant offers works of art, like steaks dry-aged on-site. With an extensive wine list, Capital Grille surrounds diners with the very best. Rich African mahogany paneling and warm lighting set the tone for a comfortably elegant evening at this upscale spot. BABOUSH This restaurant, born inside a traditional market in Marrakesh, embodies the market’s way of life. Named for Moroccan slippers, Baboush lets diners slip into a Moroccan state of mind while dining on exotic small plates inside a sleek, vibrant space. Dallas is 1,127 miles from the heart of Mexico City, but only minutes away from Gourmet Mexican cuisine. Setting the bar for Continental Mexico City Cuisine for the last 35 years, Javier’s is not your typical Tex-Mex Restaurant. You will not find tacos or enchiladas here, but you will find delicious dishes of tenderloin beef, fresh seafood, shrimp, chicken and quail dishes seasoned with traditional spices of Mexico, and influenced by its Spanish heritage. Javier’s will change the way you think of Mexican food. We surround you with a classic colonial sophistication that you will not want to leave behind. And why should you? After dinner enjoy the wonderful ambiance of the famous cigar bar, and select from the large selection of premium cigars, ports, and handcrafted drinks in a sophisticated ambiance that you won’t find anywhere else in Dallas. PYRAMID RESTAURANT & BAR The Fairmont Hotel’s Pyramid sports sleek contemporary decor and an exciting menu. The culinary philosophy draws inspiration from local purveyors and emphasizes fresh, local ingredients in an effort to minimize its carbon footprint and support the local economy. The Modern Art Museum of Fort Worth and the Nasher Sculpture Center in Dallas present a joint exhibition of the work of artist David Bates. On view through May 11, the exhibition marks the first collaboration between the two prestigious museums. For more than four decades, the native Texan has merged his distinctive American modernist style and masterful technique in creation of art that is both soulful and accessible. This thoughtful retrospective documents the extensive scope of Batesâ&#x20AC;&#x2122; media and subject matter. On display are 45 sculptures and 20 related paintings and drawings in Dallas and approximately 45 paintings in Fort Worth. of President John F. Kennedy’s life, death and legacy through historic photographs, films, artifacts and oral histories. Plan a visit to The Sixth Floor Museum today and take a trip back to the sixties. Monday Noon to 6 p.m.; Tuesday – Sunday 10 a.m. to 6 p.m. Open daily except Thanksgiving and Christmas. See what others are saying on TripAdvisor. oyster perpetual and datejust are trademarks.